Simon Rogan, broad, bestubbled and Stone Island-clad, looks more like a football hooligan than a top chef, but his palette is world renowned. His Cumbrian restaurant, L’Enclume currently holds two Michelin stars and was voted the Best Restaurant in the UK by the Good Food Guide 2014. Rogan utilises local ingredients (L’Enclume has its own farm) in a delicate, modern and often highly complex way – one of his signature dishes is venison loin with coal oil and micro fennel shoots from the farm. After turning his adopted town, Cartmel, into “Roganville” (adding a bistrot and gastropub to his stable) he recently expanded into Manchester, opening two restaurants in the grand Midland hotel, as well as a London pop-up called Roganic. 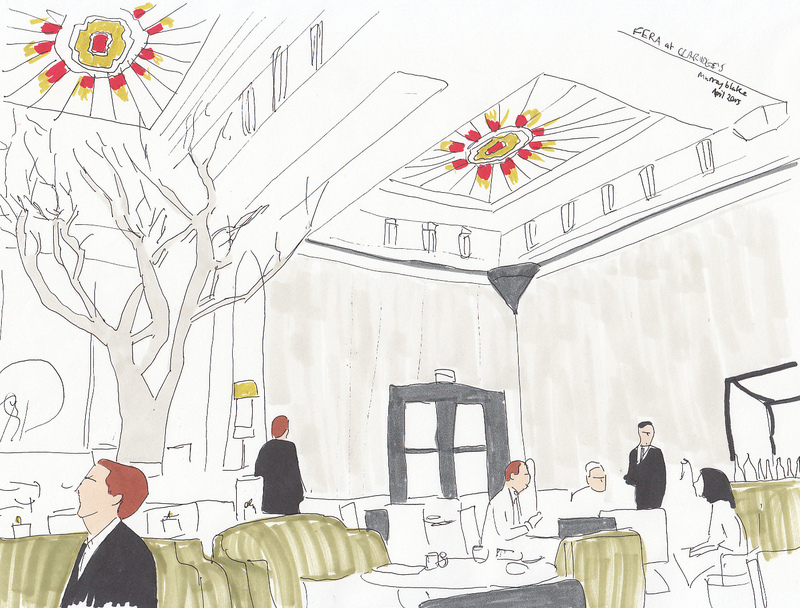 When it was announced that, after a twelve year stay, Gordon Ramsay was leaving Claridge’s there were initially rumours of Noma’s Rene Redzepi or the great American Thomas Keller taking over the hotel’s flagship restaurant, but apparently they wanted a Brit and Mr Rogan was top of their list. Fera opened in May last year and you couldn’t get a table there for love nor money (even Jay Rayner had to blag to get a table). Initial reviews were keen on the food but less so on the service, and there was a general consensus that pricing was heavy, however it still went on to win a Michelin star that autumn. 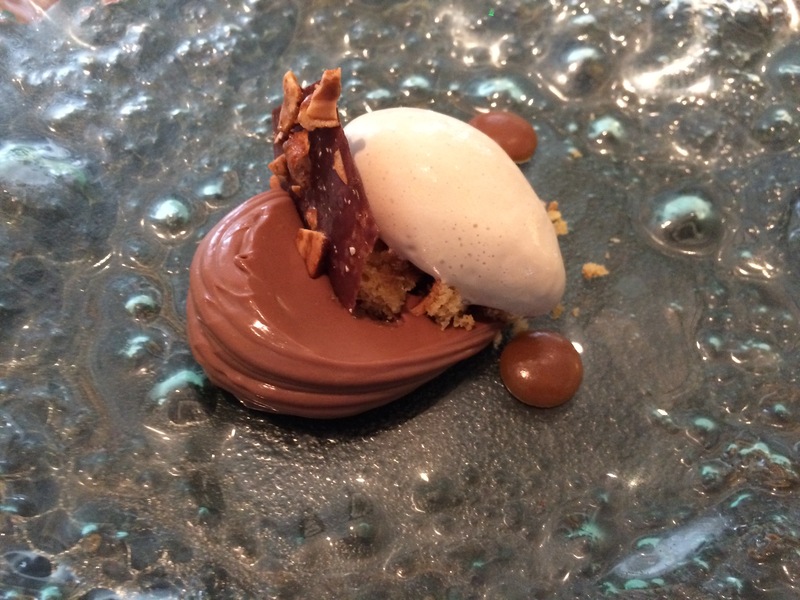 I went along for the set lunch menu which is reasonably priced at 3 courses for £35 (down from £45 when it first opened): other menus are pricier – the six course tasting menu is £105 and the main courses on the a la carte are £22-38. Fera’s setting is impressive – the art deco dining room has 16 foot high ceilings with stained glass insets, and the semi-open kitchen is a nice touch. I had a great view of the action in the kitchen, including a brooding Mr Rogan manning the pass. British designer Guy Oliver has done a brilliant job of revamping the decor – his muted grey palette allows the room’s art deco features to speak through and the centerpiece of a sandblasted manzanita tree adds a dramatic touch. 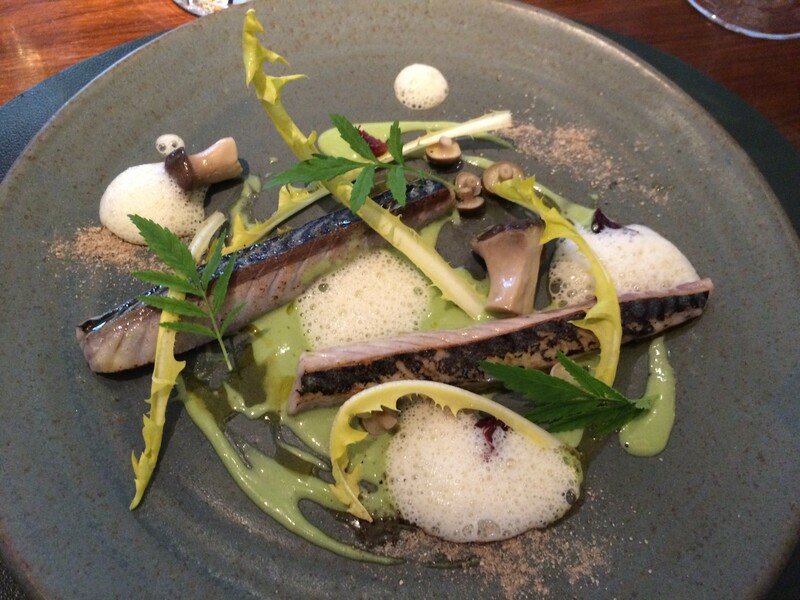 Rogan’s food is equally beautiful – I started with flame grilled mackerel with pickled mushrooms, dandelion and apple marigold. The mackerel had a hint of smokiness from the flame grilling and it was cooked through perfectly so that it was still firm and flaky. The apple marigold leaves were slightly tart, had a hint of apple flavour and worked well with the strong flavours of the fish. 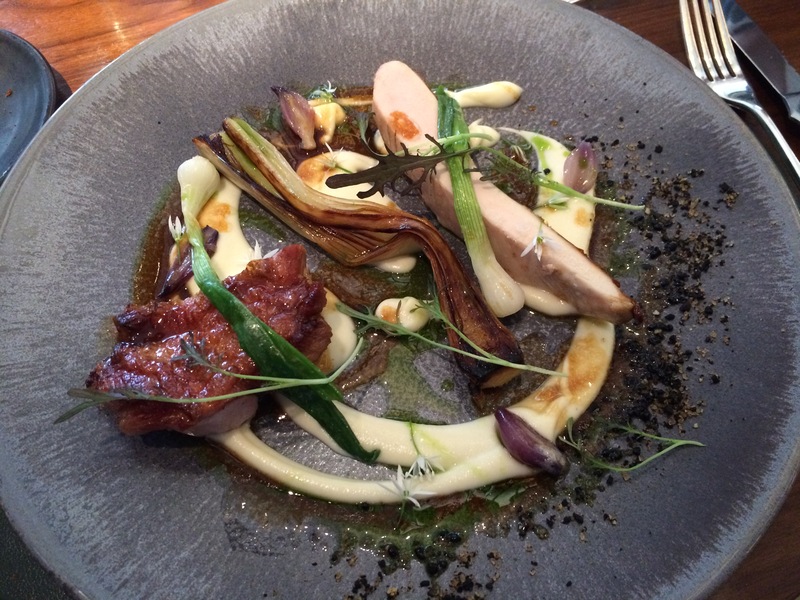 I made the potentially boring choice of chicken for main course, but thankfully, none of the dishes are dull at Fera – the breast and skin were served separately, along with a rich, velvety celeriac cream and barbecued leeks. The breast had been cooked sous vide so that it was still nicely moist, but the flesh was gamey and packed with flavour. The skin was crispy and gelatinous, with an umami punch; the skin vied with the wonderfully earthy barbecued leeks for the star of the plate. A range of micro-herbs added hints of bitterness to cut through all of the rich components of the dish, with burnt demerara (surprisingly) added balance to the salty flavour of the skin. For dessert I had smoked chocolate with peanut ice cream and verjus caramel – I tried the chocolate on its own and its deep smokiness was a bit too much (it reminded me of islay whisky), but on second taste, along with the light and nutty ice cream and sharp, acidic apple, the dish was a triumph. As expected, the service was rather stuffy and our waiting staff were not very attentive, preferring to concentrate their efforts on the surrounding tables of ladies who lunch and mahogany-faced international businessmen, but don’t be put off by this – even poor service can’t dampen the glory of Rogan’s food. The restaurant sounds nice too – will have to check it out. Thanks! Hope you enjoy Fera if you make it along.